Figured I would continue the picture series . Now that the Admin Menu is done for the most part I have started on the new Vehicle stuff. I have made some pretty good progress with the new system. Building vehicles will be alot more detailed and this system will actually give players another means in getting resources on the map. I will also be working on persistent inventory for vehicles. This means that each car will have its own inventory. The existing inventory will append to player inventory until all the old items are moved out. 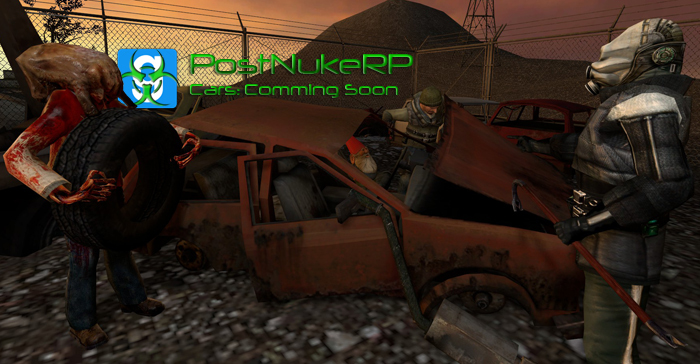 We will also be adding support for Doc’s Half-Life 2 Drivable Vehicles. This system should also make it easier to add other custom vehicles to PNRP. If you want to see a higher res version of the pic, you can find it here: http://eldarstorm.deviantart.com/art/Ca ... -545064859.